Arriving in a new city is always exciting. Just the thought of what you’re going to see, the experiences you’ll gain and the people you may meet is an adrenalin rush in itself. It’s the serendipity of a first visit that makes it so sweet. And that’s exactly what I felt when I first arrived at Beijing’s T2 airport a year ago. A year later, we’re filming at T3, the new airport. While I do have a certain fondness for T2, I’d be lying if I said the Burger King at the new terminal didn’t sway me a little. When I first arrived, cabbing to work meant passing Tiananmen. I always felt on top of the world every time I drove past the iconic gates, never imagining that I’d be living in this city. I thought that I might tire of it eventually but honestly, a year on and I still feel the same. So when Marc, Yin and I were deciding which episodes we would be filming between us, I felt like I drew the long straw when I was assigned central Beijing and the CBD area, encompassing some of the places that meant the most to me. The first time I visited, I went with my ‘tourist eyes’ but when we were filming, I brought my ‘residence eyes’, taking in details that I’d missed before when I was just touring the city. But I am no veteran, so it was still exciting discovering bits and pieces about Beijing and its sights. There’s a first for everything, enjoying 798 by night. I’d seen the flag lowering ceremony a couple of times but watching the flag being raised was a whole different experience. I’m a night owl so when the sunrises, chances are, I’m just about to hit the sack. 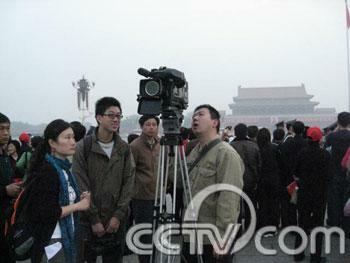 You can imagine how torturous it was going to bed at 8pm the night before, so we could get to Tiananmen Square early the next morning for a good viewing spot. If you’re thinking, big deal, it’s just a flag raising ceremony in the early morning, I guarantee you, it really isn’t. I never thought I would be so excited. Bring a sweater though; it can get a little chilly in the mornings.